Swatch Group has filed a lawsuit against Samsung Electronics, citing trademark infringement. The suit, which was filed Feb. 22 in New York, asserts the “unabashed copying” of the intellectual property aims to “trade off the fame, reputation, and goodwill” of the Swiss watch company’s products. 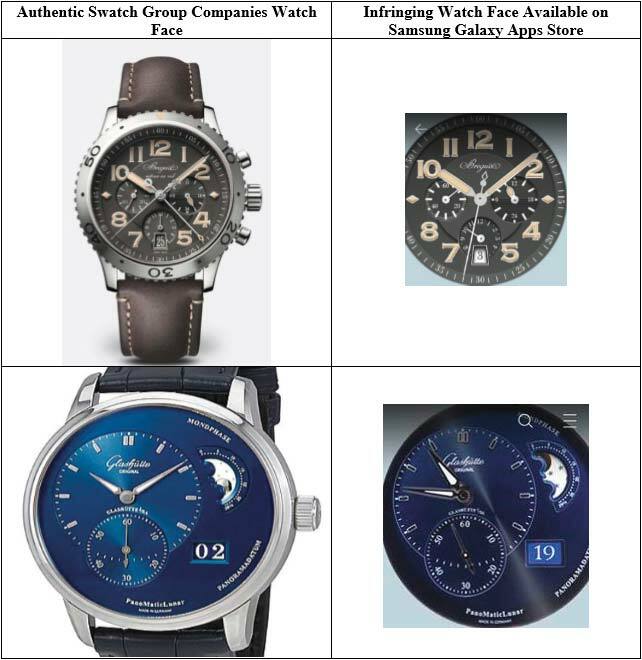 “As a result of [Samsung’s] actions, consumers and the general public are deceived into believing that the Samsung Smartwatches are actually products of the Swatch Group Companies or are endorsed by, sponsored by, or affiliated with the Swatch Group Companies,” the filing reads. The suit goes on to say Swatch Group wrote to Samsung Electronics and its Swiss subsidiary, Samsung Electronics Switzerland GmbH, last December to alert the companies of the violation. Samsung responded by removing the identified watch faces, which were created by third-party developers, from its Galaxy Apps Store. Samsung has yet to respond to the complaint. The full filing can be accessed here.